James Pavlock, a federal prosecutor, has restored and updated his rowhouse, built in 1859. The airy, white meringue-shaped polyurethane fixture hanging in the living room of James Pavlock’s Spring Garden rowhouse came from an Old City lighting store. The Victorian-style register grate tucked into the mantel — all 700 pounds of it — came from England by way of an Oregon dealer and was fitted as a gas fireplace by a local craftsman. It’s contrasts like these that have helped Pavlock, a federal prosecutor, mold the three-story Italianate house in an individual, eclectic style. “I wanted to keep the original architecture but with modern furniture,” says Pavlock, who bought the house in 1992. James Pavlock's living room features a white meringue-shaped fixture, an example of his melding of old and new. First, some history, which Pavlock has carefully researched over the years. The house was built in 1859, probably for a worker or low-level manager at the Baldwin Locomotive Works or another nearby factory. Executives lived in mansions a block or so away, Pavlock says. The house eventually was sold to an Irish family and passed down from generation to generation until the 1950s. He says this was fortunate because it meant that few major architectural changes were made, although doors, window frames and other wood surfaces were covered with orange paint that had to be painstakingly scraped off. Still, the house “was something of a fixer-upper, but it did have good mechanicals,” including copper piping. “I was taken by the fact that all the rooms had windows and that there was a ‘breezeway’ between the homes on one side to allow light in all the rooms on every floor,” he says. The house was "something of a fixer-upper," James Pavlock says. "I've tried to be true to the architecture but make it a modern, comfortable home." But there was no bathroom on the third floor, the brick facade was bulging out with the beginnings of an architectural potbelly, and an unattractive linoleum floor had to be ripped up to make way for the heart pine floors Pavlock found through most of the house. Some of the renovation was a family affair. Pavlock’s father, a shop teacher and carpenter, and an electrician uncle would sometimes come down from Central Pennsylvania to help. The front wall was rebuilt, which took a month. A brick hearth was removed from the kitchen to make room for standard fixtures, and a back deck was built to look out at the Art Museum. The kitchen ceiling was restored to its original height. An especially original touch was the use of cherry wood flooring from an Amish dealer as a back panel for the television set in the media room. Pavlock bought classic Mies van der Rohe-style Barcelona chairs for the living room. In the media room, the television is mounted on a band of cherry wood flooring from an Amish dealer. The front door was replaced thanks to serendipity. Pavlock, who has worked closely with the Philadelphia Historical Commission on many of the renovations, quickly realized the front door wasn’t original. But he found a battered door being used as a workbench in the basement that turned out to be the old front door. So he had a mahogany facsimile made. Pavlock’s hobby is playing the piano and organ, performing in local churches and other venues, and even here, he blends the classical and the modern. In the living room, near a window looking out onto the street, is a 1927 Steinway. On the third floor is a modern organ that uses Hauptwerk software that lets Pavlock emulate the sounds of famous organs throughout the world. Pavlock, who is 60, assumes that somewhere down the road he won’t want to negotiate the two flights of stairs. But he plans to keep the house as long as he can. Is your house a Haven? Nominate your home by email (and send some digital photographs) at properties@phillynews.com. 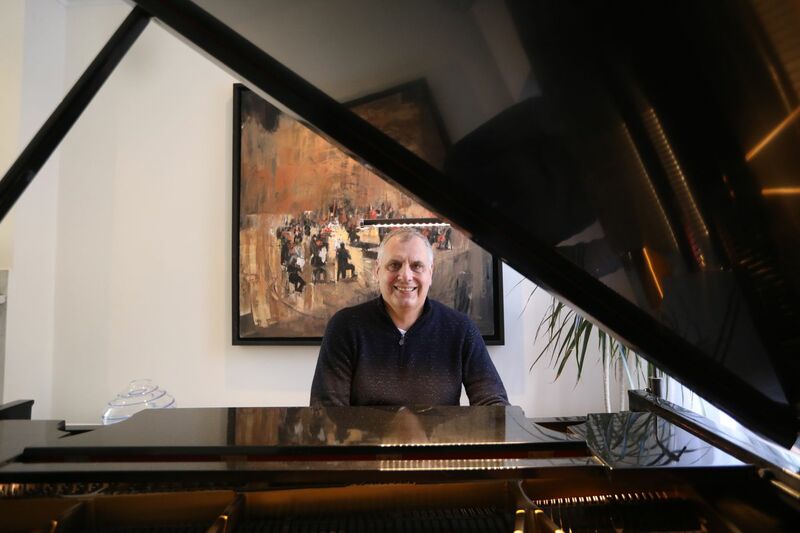 James Pavlock, who performs in local churches and other venues, has a 1927 Steinway in the living room and a modern organ with Hauptwerk software on the third floor.